July 5th and 6th are two of the most important holidays on the Czech calendar. July 5th is Saints Cyril and Methodius’ Day (Den slovanských věrozvěstů Cyrila a Metoděje), which honors the 9th Century missionaries who brought Christianity (and an alphabet) to the Slavs. July 6 is Jan Hus Day (Den upálení mistra Jana Husa), a date that commemorates the religious reformer who was burned at the stake on July 6, 1415. 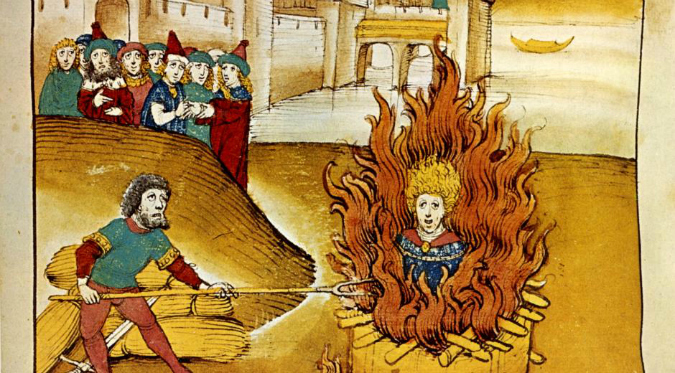 This Monday marks the 600th anniversary of the burning of Jan Hus, and state-wide celebrations can be expected throughout the Czech Republic on the holiday weekend. In Prague, the festivities will begin on Saturday with a special videomapping event at Old Town’s Bethlehem Chapel (Betlémské kaple), which is scheduled to begin at 22:30. But the main events will take place on July 5th and 6th with a variety of celebrations around the city – many at Old Town Square, where the statue of Jan Hus is one of Prague’s most recognizable landmarks. The events are organized under the banner of Hus Celebrations 2015 (Husovské slavnosti 2015). A full breakdown of events can be found at their website. An opening ceremony at Old Town Square on the evening of July 5th will be conducted by the Moravian Philharmonic Orchestra Olomouc. More music and theatrical performances will take place at the Square on Monday. Also on July 6, Prague’s Fruit Market (Ovocný trh) will become a medieval marketplace complete with fencing and a puppet theater. St. Nicolas Church, Salvátor Church, Martin in the Wall Church, and other venues will also host special events throughout the weekend. For more details, see the website of Hus Celebrations 2015. Might Speed Limits in Czech Cities and Towns go Down to 30 km/h?